As we got off the Air China airliner, the damp July air reeking of paddy fields and strong manure reminded us of our arrival in Sichuan Province, the heart of agrarian China. The grey monsoon clouds gave us a hint that our trip would be blighted by wet weather. This was not altogether an unwelcome prospect, as I, along with my colleagues Jamshed Khan and Amir Liaqat could stay longer and discover more, while waiting for bluer skies needed for evaluating a new fighter, at the Chengdu Aircraft Industry Group’s aircraft manufacturing plant in Chengdu. The city is well-known to quite a few PAF personnel who got their initial training on the FT-5, F-7 and lately, the JF-17 aircraft. 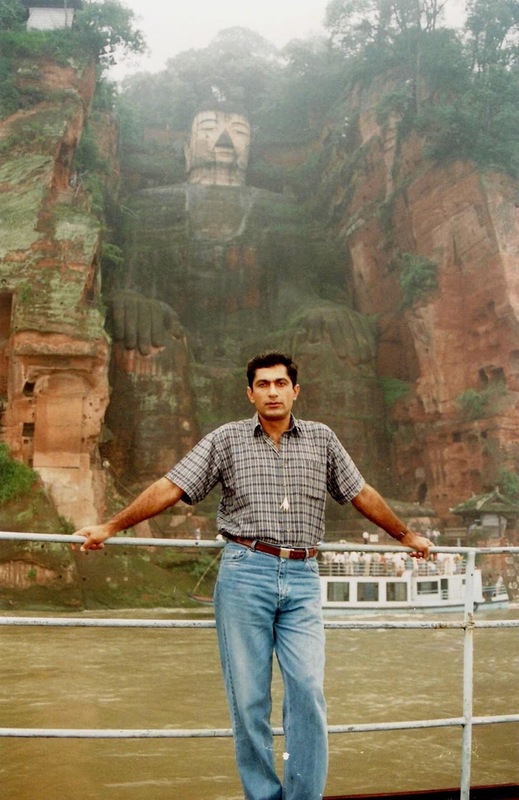 To the rest of Pakistanis, Chengdu is a nondescript city much below Beijing, Guangzhou (Canton) and Shanghai in their business or tourism priorities. They would do well to note that Chengdu, the capital of Sichuan Province, now ranks as one of China’s largest cities. Chengdu was recently voted as the fourth most liveable city from an environmental standpoint. It is also listed amongst the gastronomy capitals of the world, though with menus featuring pigeon’s egg soup, sliced eels (raw) and pig’s trotters, one could see why we had to make do with sticky rice, soya bean curd and noodles for the better part of our month-long stay. As we drove to the Jin Jiang Hotel in central Chengdu, the first thing that caught our eye were the hundreds of cyclists who would amass during the minute or so that the traffic light remained red, raring to pedal off again at the turn of green. Men and women of all ages were on bicycles; the poorer families who could not afford more than one bike made use of tricycles, with the daily groceries, the biker’s wife and an odd pet, all huddled in a big wooden crib in good view of everyone, though nobody seemed to care except us! 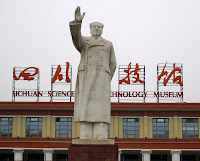 After checking in the hotel, we decided to take an exploratory walk on the North Renmin Road which led to the colossal statue of a little-revered Mao Tse-tung, overlooking the Tianfu Square in the city centre. Nearby was the big complex of the Spring Department Store and People’s Market which had just about every daily use item at very cheap prices. Some men idled away, their vests rolled up to their chests for better ‘air conditioning’ in the humid weather, while others chatted rather loudly often spitting in between the exchanges, these being habits common to the less urbane folk, as we found out. While we were strolling by the roadside, we observed a noisy scuffle between a man and a woman. On the way back to the hotel, we were surprised to see the man handcuffed inside a small traffic police kiosk, while the woman, apparently his wife, taking pot shots at the wretched creature as the police desperately tried to keep her off. Our interesting walk came full circle minutes later, when, quite in contrast to the ugly scene, we saw a happy bride and groom being photographed on the studio steps, loudly cheered by a huge crowd of passers-by. It was an exciting introduction to Chengdu, as much as China, which we were visiting for the first time. Next day, we were formally welcomed to the aircraft factory by the general manager over a sumptuous lunch, but the 20-course formal dinner the following evening outdid any banquet that we had ever been feted with. Our hosts were careful to ensure that no kind of animal appeared on the platter and, the qipao clad waitresses were under special instructions to serve the fiery Moutai liquor only to the Chinese. We sipped green tea instead, much to the amusement of our hosts, for whom tea-drinking is a valued tradition in Chengdu. During small talk, I ventured to ask one of the managers seated next to me about his children. Over a hearty laugh, he told me that it was an irrelevant question in China as Chinese couples (except ethnic minorities) have only one child. He also added that I needn’t ask about his relatives as the modern Chinese do not have a brother, a sister, an uncle, an aunt, a nephew, a niece or a cousin, all as a consequence of a one-child policy. Of course, it dawned on me in a while! 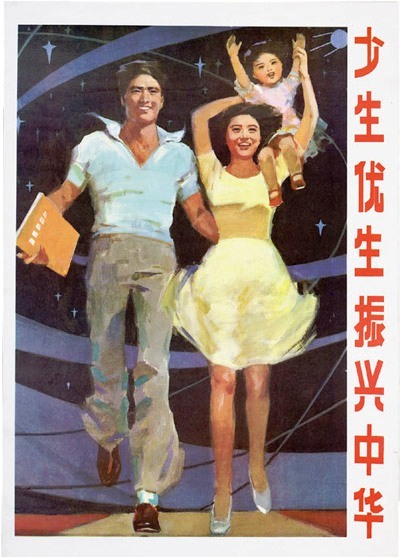 The cheerful roadside family planning posters hadn't conveyed the deeper implications. As the days wore on, our flying became intermittent, subject to ever-changing weather. On bad weather days we took tours of the hugely overstaffed aircraft factory, and discussed aerodynamics with accomplished aircraft designers led by the well-respected Professor Ma. Our long lunch sessions at the factory always started with sweet dishes followed by sour ones, cold servings followed by hot ones, all punctuated by helpings of fried peanuts eaten with chopsticks, for good measure. Sichuan cuisine had never tasted the same in Lahore, for sure. After-dinner walks along the Nanhe River, which traces a swath through the centre of the city, were occasionally alternated with live music shows at the hotel. Our favourite part featured the erhu, a two-stringed bowed instrument that almost always forms part of any classical Chinese orchestra. One particular erhu player, a maestro of sorts, could make his instrument whine like a baby, neigh like a horse, and play sounds of wind, rain and thunder, depicting the seasons. Weekends were well spent exploring the suburbs of Chengdu. One Sunday we visited the Thatched Cottage of Du Fu, on the western suburbs of the town. Du Fu is one of China’s greatest poets (712-770 AD) who, in one of his wanderings, spent four years in Chengdu. 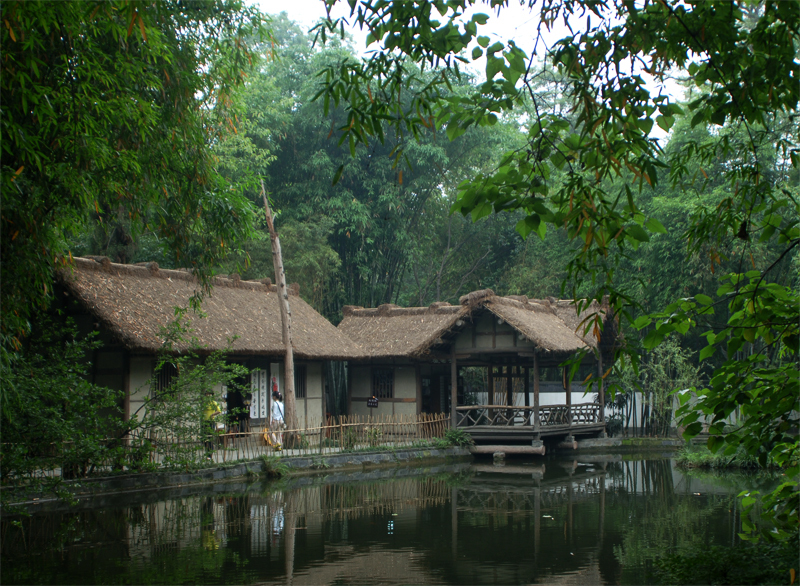 His reconstructed cottage adorns a beautiful park by the serene Huanhua Stream. Sichuan is famous for its giant pandas (Ailuropoda melanoleuca) and it was thoughtful of the factory management to organise a trip to the Wolong National Nature Reserve, about 130-km north-west of Chengdu. The huge sociable creatures belied their lineage of the ferocious bear family, as they enjoyed being cuddled and patted and fed bamboo shoots from our hands. Another attractive animal at the Reserve was the cat-sized red panda (Alurus fulgens) which is classified as a family unto itself, though having some relation to raccoons and weasels. The only thing common with the giant pandas is a diet mainly of bamboo shoots, though it is also omnivorous. We fed one of them with peanuts which it devoured with relish. For the remaining days in Chengdu, we found shopping for antiques a good evening pastime, and collected some ornate ceramic teapots and enamelled treasure boxes from the numerous stalls along Renmin Road. Jamshed was particularly adept at haggling and he would often scoop up wares at 10% of the asking price, much to the amazement of everyone around. The antiques stalls have since been moved to the dedicated Songxianqiao Antiques Market which has made a name all over China. Chengdu is claimed to have a 2,000-year history but unfortunately, has little to show for it in extant buildings of earlier eras. An ancient city wall was brought down thoughtlessly on orders of Mao, though the city fathers have been careful not to do the same to his statue in Tianfu Square. The older traditional buildings are sadly being replaced by soulless steel and concrete ones. Despite all the change that has made it big, Chengdu still retains a small-town character reflected in the easygoing, rustic lifestyle of its simple inhabitants. Will Chengdu still be the same when the present older generation is no more? After tomorrow, who can say? © KAISER TUFAIL. This is an open-access article published under the terms and conditions of the Creative Commons Attribution Licence, which permits unrestricted use, distribution, and reproduction in any medium, provided the original author and source are credited. This article was published in the daily newspaper The News International, on 25 Nov, 2012. © KAISER TUFAIL. Watermark theme. Powered by Blogger.